For every laser at threshold (where it is just beginning to emit coherent radiation), there exists a related optical device, termed a “coherent perfect absorber” (CPA), which will absorb completely the exact electromagnetic mode that the corresponding laser emits. This exact relationship between electromagnetic systems can be called the “CPA theorem”. Last July, our team at Yale developed the basic theory of CPAs and proposed methods for demonstrating the effect in semiconductor cavities ; very recently we have achieved the first experimental demonstration of coherent control of absorption in a two-channel CPA using a simple silicon slab cavity , as described below. Every laser has a gain medium – an atomic, molecular or solid substrate that is pumped with an incoherent energy source to cause it to amplify light; this amplification is characterized by a gain coefficient or (equivalently) a complex-valued index of refraction with a negative imaginary part. The corresponding CPA is obtained by replacing the gain medium of the laser by a “loss medium” which has exactly the same magnitude of absorption coefficient (imaginary index), but with opposite (positive) sign. Since the appropriate loss materials in their ground states are absorbing, no pump energy is needed in the operation of a CPA, just a tunable loss medium and a cavity which can be tailored to the required index of refraction. The time-reversal symmetry of the laser equations at threshold then implies that absorption of the appropriate incoming (time-reversed) lasing mode at the lasing frequency will be complete. This narrow-band perfect absorption is achieved by, in effect, creating a perfect “interference trap” for this incident mode (only). This is, of course, impossible to do with a lossless cavity; energy conservation demands that the light must escape in some direction. But the CPA Theorem says it is possible to do this in an absorbing cavity at a discrete set of frequencies, if the absorption coefficient of the cavity is sufficiently tunable. There are two key points that make coherent perfect absorbers interesting and novel. First, the perfect absorption comes from the trapping of radiation for infinite time, not by enhancing the rate at which the loss medium absorbs. Thus materials with quite low absorption coefficients at a certain wavelength can be made to absorb perfectly at those wavelengths with an appropriate cavity. Moreover, if you further increase the absorption coefficient in such a system, it absorbs less total radiation, because the trap becomes leaky. Second, and even more importantly, the CPA is, in general, a device in which the degree of absorption can be controlled optically, by varying the properties of the input fields at a given wavelength. The reason that this is possible is that perfect absorption relies on a particular interference pattern being generated in the CPA cavity, which traps radiation indefinitely. If the corresponding laser would emit N distinct beams, then the CPA will only perfectly absorb a pattern of radiation involving all N beams illuminating the cavity with precise amplitude and phase relationships. If the N beams illuminate the cavity with a different radiation pattern, even if the frequency is correct, the radiation can be scattered out with very little absorption. In our initial paper on CPAs we showed in a numerical simulation that a Si-SiO2 periodic cavity could be switched between 100% and 1% absorption just by varying the relative phase of the incident fields. Another important finding was that silicon is a very favorable material for the loss medium in a CPA. Because of its indirect bandgap, (which makes it a poor gain medium for a laser) there is a smooth variation of the absorption coefficient near the band edge which allows one to come very close to the ideal CPA absorption condition simply by tuning the frequency. As shown in Fig. 1, the theory said that in this manner one could pass within ten parts in a million of complete absorption (for perfectly monochromatic input beams). Fig. 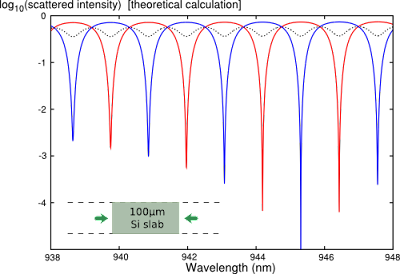 1: Semi-log plot of normalized output intensities against input wavelength, computed for a 100-micron Si slab. The blue and red curves correspond to parity-even and parity-odd scattered modes, respectively. CPAs (or near-CPAs) occur when either curve dips towards negative infinity (zero scattering). While the theory implied that extremely complicated cavities should be capable of functioning as CPAs, we immediately decided to focus on demonstrating the effect in the simplest geometry that allowed optical control of the absorption. We had learned that the very simplest possible CPA had already been demonstrated in several forms without using the relationship to lasing [6-8]. 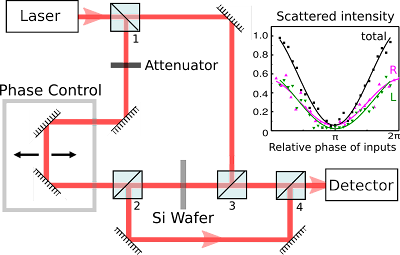 In the earlier devices the CPA had only a single input beam, which was made to interfere with itself, either by bouncing off mirrors or by coupling in and out of an adjacent cavity. These devices showed that CPAs have potential applicability as optical modulators, detectors and filters, but because they only involved one input beam they did not exhibit optical control of absorption through variation of the phase and amplitude of the input field. Thus we set out to demonstrate this effect using a two-beam set-up, illuminating a silicon wafer acting as a low-Q Fabry-Perot cavity (“etalon”). Fig. 2: Experimental set-up. Inset: scattered intensity (total, and to the left and sides of the wafer) when the input is tuned to a parity-odd CPA resonance frequency, showing almost complete material absorption when the input beams are out of phase. The experimental configuration is shown in Fig. 2. A laser beam from a tunable (800 to 1050 nm) continuous-wave Ti:sapphire laser is split into two beams and routed through different arms of an interferometer onto opposite sides of a silicon wafer of thickness ~110 mm. The wavelength of the light is varied near 1000 nm at which the wafer is predicted to exhibit strong CPA resonances. At each frequency the relative phase of the two beams is varied by 180 degrees and the amount of scattered light is measured. At certain frequencies the scattered intensity varied by two orders of magnitude in response to this phase variation; these were the frequencies approaching the CPA resonance. Thus by simply varying the relative phase of our input fields at fixed frequency we controlled the absorption of the silicon wafer, changing it from very strongly absorbing to weakly absorbing. At other frequencies, between the CPA resonances, the theory predicted much smaller or even vanishing sensitivity of the absorption to the relative phase of the input beam; the experiment also confirmed this effect. Having demonstrated the CPA effect in its general form, we hope that a number of applications for CPAs will develop. Its modulation and detection capabilities make it a candidate for use in integrated optical circuits; however one of the most useful forms of CPA, the critically-coupled fiber-ring-cavity system, has been known for quite some time  and is already used extensively in prototype systems. It remains to be seen if other, newer variants on the CPA inspired by our work, will be useful in this context. The CPA concept is a natural one for coherent spectroscopy of molecules in which a small coherent diagnostic signal is buried in larger incoherent noise at the same wavelength. A particularly exciting and novel potential application of the CPA concept is to strongly scattering media, which look opaque because typical radiation patterns are backscattered with very high probability. If an appropriate absorbing medium is buried below the surface of this opaque medium, the theory implies that a precisely shaped coherent signal can be made to penetrate the opaque surface layer and will be absorbed fully deep within the medium. Such a technique may find important applications in radiology and fluorescent spectroscopy. The CPA concept is not well-suited to applications in energy harvesting and stealth technology as it is intrinsically a narrow band effect coherent effect which does not increase average absorption of broad-band incoherent radiation. H.E. Türeci, H. G. L. Schwefel, P. Jacquod, and A.D. Stone, “Modes of wave-chaotic dielectric resonators”, Progress in Optics, Vol 47: 75-137 (2005). Abstract. H. Cao, “Lasing in Disordered Media”, in “Progress in Optics”, ed. E. Wolf, North-Holland, vol. 45: 317-370 (2003). Abstract. H.E. Türeci, L. Ge, S. Rotter, and A. D. Stone, “Strong Interactions in Multimode Random Lasers”, Science 320, 643 (2008). Abstract. Y. D. Chong, L. Ge, H. Cao, and A.D. Stone, “Coherent Perfect Absorbers: Time-reversed Lasers”, Phys. Rev. Lett. 105, 053901 (2010). Abstract. W. Wan, Y.D. Chong, L. Ge, H. Noh, A.D. Stone, and H. Cao, “Time-Reversed Lasing and Interferometric Control of Absorption”, Science 331, 889 (2011). Abstract. 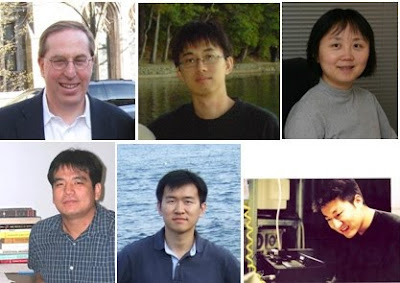 R. H. Yan, R. J. Simes, L. A. Coldren, IEEE Photon. Technol. Lett. 1, 273 (1989). Abstract. M. S. Ünlü, K. Kishino, H. J. Liaw, H. Morkoç, J. Appl. Phys. 71, 4049 (1992). Abstract. A. Yariv, “Critical coupling and its control in optical waveguide-ring resonator systems”, IEEE Phot. Tech. Lett. 14, 483 (2002). Abstract.